Fifth disease is a mild rash illness that occurs most commonly in children. 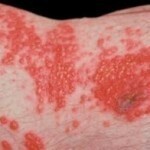 The medical name for fifth disease is erythema infectiosum (EI). It is seen primarily in school-aged children between 5-14 years of age during the spring and winter. The ill child typically has a “slapped-cheek” rash on the face and a lacy red rash on the trunk and limbs. Occasionally the rash may itch. An ill child may have a low-grade fever, malaise, or a “cold” a few days before the rash breaks out. The child is usually not very ill, and the rash resolves in 7 to 10 days. Fifth disease is caused by human parvovirus B19 virus (this virus infects only humans). The virus is thought to spread via droplets in the air (respiratory secretions transmitted by coughs and sneezes) and blood from other infected people. During the first stage of the illness, nasal secretions contain the viral DNA. Blood has been found to contain viral particles as well as DNA. Cases of fifth disease can occur either sporadically or as part of community outbreaks. Outbreaks occur mainly in elementary schools during the spring. Half of the cases occur from spread of the virus to others in the household. Transmission of the infection in schools is less common. An adult who is not immune can be infected with parvovirus B19 and either have no symptoms or develop the typical rash of fifth disease, joint pain or swelling, or both. Usually joints on both sides of the body are affected. The joints most frequently affected are the hands, wrists, and knees. Joint pain and swelling usually resolve in a week or two, but they may last several months. About 50% of adults however, have been previously infected with parvovirus B19 and have developed immunity to the virus and cannot get fifth disease. The name fifth disease comes from a classification system used many decades ago. The five most common rashes (or exanthems) of childhood are traditionally recognized to be measles (rubeola), chicken pox (varicella), German measles (rubella), roseola and fifth disease (parvovirus B19 infection).